Spray 9-inch springform pan with cooking spray. Mix almonds, graham cracker crumbs, sugar and butter together. Place crust ingredients in pan and pat down on bottom and sides of pan, going up the sides about ½ inch. Place on baking sheet and bake for ten minutes at 350 degrees for ten minutes. Heat cream, butter and sugar in saucepan and bring to a boil. Remove from heat and add chocolate morsels, stirring until completely melted. Allow mixture to cool a bit before adding egg yolks. Stir until mixture is smooth. 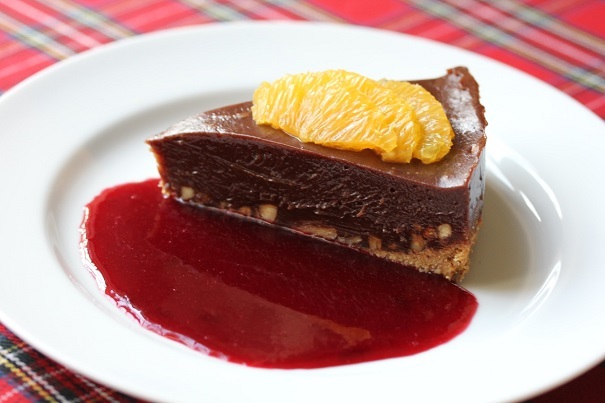 Place toasted pecans on top of tart crust and pour chocolate mixture over bottom of tart. Place in oven at 350 degrees for 8 minutes. Remove from oven and allow to cool for 4 hours in refrigerator. Remove side of pan and with a knife dipped in hot water, slice into 12 equal portions. 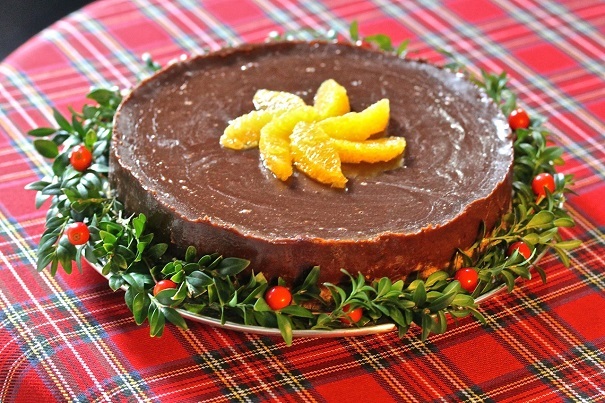 Serve with Berry Sauce and top each slice with 3 orange segments. Heat all ingredients in large saucepan until it comes to a boil. Gently press to remove all seeds. Remove all seeds. Allow to chill.